In celebration of Jen's site MOMSPatterns being up & running for three solid years, she's running a Happy Anniversary To MOMS Sale (combined with a Labor Day sale) through the weekend! Save 25% on by using coupon code 'yayjen' until Tuesday, September 8, 2009 at midnight EST. Jen's also just moved another 50 patterns to the Sale Section which has patterns priced from $1-$5. AND she's still adding 30-40 patterns every day for you to choose from. (And she offers combined & discounted shipping for multiple purchases.) Happy Anniversary! Lisa at the Vintage Fashion Librarian is giving away a Mood Fabrics bag (of Project Runway fame)! Very spiffy. Sorry for the light posting folks, but in addition to moving across the country for my internet startup, I *just* finished (the first draft, anyway, I expect my awesome editors to add some of their awesome to it) of The Secret Lives of Dresses novel, due out next year from Grand Central (in the US) and Hodder (in the UK). Whew! 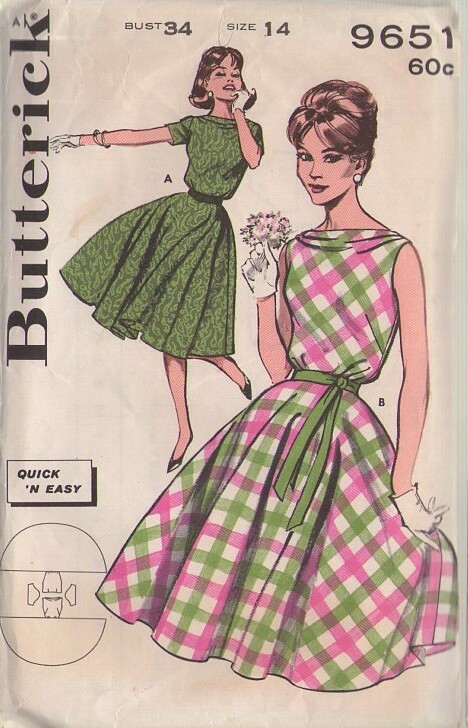 Oh, how perfectly this pattern model typifies the easy, breezy life I imagined for myself when I used to gaze upon my mummys patterns as a wee tot. I think it helps that theyre so rarely pictured as being actually ENGAGED in anything….most usually just standing there, with an imaginary wind ruffling their skirts and (lacquered) hair.The one in the back seems to be experimenting with some sort of mood-altering substance (from Plaids nosegay?) This I foresaw for myself, as well. Congratulations on the book progress. Cant wait till its out. Do you find it ironic that you have to move geographically for an *Internet* startup?Thanks for the personal updates, I love the dress, cant wait for the novel! What a novel concept…a plaid dress. An earlier incarnation of a hot trend today. Glad to hear youve settled in, Erin. Can fabric shopping be far behind? YAY Secret Lives! Can we preorder? Bravo on finishing the big draft! I cant wait to read it. And I wish I had that pink and green dress. Its fabulous. Are we having another International Wear a Dress Day this year? That dress is so lovely!I cant wait for The Secret Lives of Dresses. Also, is Wear a Dress Day/Week going on this year? OMG Erin!this start up of yours is HUGE (http://www.nytimes.com/2009/07/05/business/05pr.html?pagewanted=all)You are to be congratulated!I hope you can continue to find bits of time to entertain your loyal group here at Dress, because we really love your blog ( your too). Actually, this cracks me up because, just the other day, I was checking out 1940s dress patterns on eBay and found one with a bunch of bored teenagers leaning on mops. Im not kidding. The contrast is startling. I wonder how public morale and self-image affected pattern packet art? way to go Erin… Thank you for keeping us informed! Congratulations on everything, the book, the move the startup. Love all of your stories. Oh good Lord — I MADE this pattern — more than once —- and, yes, I not only wore it to work, I actually cooked dinner wearing it. Ah, the days of a young bride when we all were required to look like Donna Reed! One acknowledges that life is not very cheap, but people need cash for various things and not every person gets enough cash. Therefore to receive good loans or sba loan will be a proper way out.